From Middle English chimere, from French chimère, from Latin chimaera, from Ancient Greek χίμαιρα (khímaira, “chimera; female goat”), from χίμαρος (khímaros, “male goat”), from Proto-Indo-European *gʰei-. The Latin form has become more common from the 16th century. 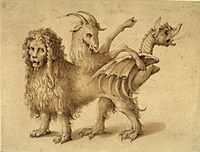 (Greek mythology) Alternative letter-case form of Chimera (a flame-spewing monster often represented as having two heads, one of a goat and the other of a lion; the body of a goat; and a serpent as a tail). Bellerophon was commanded to destroy this monster, and with the assistance of the flying horse, Pegasus, he slew the chimera. (mythology) Any fantastic creature with parts from different animals. A voice had called him forth to think in solitude—a voice he durst not resist, the awful one of the future. It fell on John's heart like the mutter of approaching desolation. He heard it coming on, as the spell-bound in a hideous dream await, wordless and shivering, the progress of some chimera monster, whose grasp is to crush and destroy. The Magophonia was essentially the eruption of a long-simmering animosity between the pārsās (who revered Ahura Mazdā) and the Median magi (who believed in the supremacy of Mithra and Apam Napāt). A vivid expression of this animosity is displayed on the door jambs of Persepolis, where Darius is killing with a dagger a chimera monster with a scorpion tail. Anything composed of very disparate parts. The car which he built himself was a real chimera: half Volkswagen and half Porsche. Throughout 12 tracks the ear is treated to a musical chimera where folk frolics and gypsy jaunts fight with klezmeric machinations and Slavic ska to form a brass infused Ottoman folk-punk or it might just be the sound of Bellowhead working as the house band in an Armenian brothel. A foolish, incongruous, or vain thought or product of the imagination. It was very different, when the masters of the science sought immortality and power; such views, although futile, were grand: but now the scene was changed. The ambition of the inquirer seemed to limit itself to the annihilation of those visions on which my interest in science was chiefly founded. I was required to exchange chimeras of boundless grandeur for realities of little worth. (architecture) A grotesque like a gargoyle, but without a spout for rainwater. A chimera is essentially a hybrid animal made up of various animal parts. The famous parapet chimeras on the north tower of Notre Dame in Paris, especially the brooding double-horned fellow with protruding tongue on the west parapet originally assumed to relate to a thirteenth-century model, are classic examples. (genetics) An organism with genetically distinct cells originating from two or more zygotes. [P]reembryo cells from different parents can combine and grow into a chimera (an individual with cells from two or more zygotes)—in this case, an entity containing genetic material from four parents! Spontaneous chimeras […] occur rarely in our species. Recent examples include a woman who resulted from the merger of two zygotes or the early fusion of two genetically distinct embryos. Usually chimaera: a cartilaginous marine fish in the subclass Holocephali and especially the order Chimaeriformes, with a blunt snout, long tail, and a spine before the first dorsal fin. The chimeras […] are an extant group of about 30 species. They have the upper jaw fused with the cranium and a gill cover over the four gill slits. They also have toothy plates that give them a ratlike appearance, thus the common name "ratfish." The group occurs in ocean depths worldwide, where they mainly feed on invertebrates. ↑ 1.0 1.1 “chimera; chimaera, n.”, in OED Online ⁠ , Oxford: Oxford University Press, 1889. From Latin chimaera, from Ancient Greek Χίμαιρα (Khímaira). This page was last edited on 23 February 2019, at 04:40.